The Magellan 800i handheld and presentation scanner is the enhancement of the existing series; it unites all the properties of its predecessors with a low price. Equipped with the newest imaging technology, it reads barcodes both quickly and error-free. The Illumix technology guarantees quick barcode bypassing and simple reading from monitors and displays. These features improve both speed and productivity at the checkout. 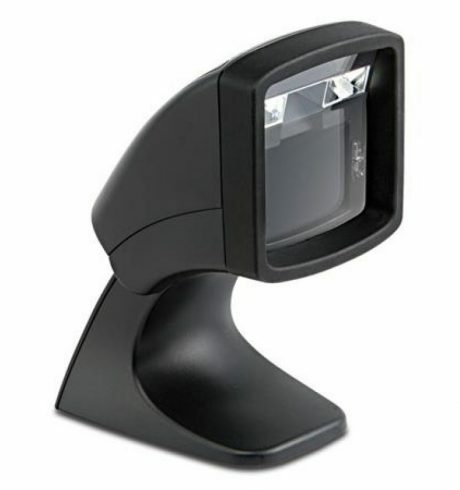 The scanner automatically adjusts the brightness and imager properties, for easy readability even under very bright or very dark conditions. Additionally, it is EAS and Interlock-compatible. According to your requirements, you can choose between the 1D or 2D models. As needed, you can reconfigure the 1D imager – upgrades are simple and can be performed anytime. In short, you only buy what you need. Thanks to its compact housing, you save valuable space. You may also optionally mount the scanner onto the counter or the wall. Since the imager contains no movable parts, the Magellan 800i is highly rugged. You can further reduce your operating costs via the programmable sleep mode.